As I mentioned in an earlier post, the studio doubles as a guest bedroom. In early August, my son and his family came for their annual beach vacation. So, the studio was the domain of my teenage grandsons for eight days. Time to decamp to the garage studio and experiment with translucent clay and inclusions for a new series based on Cynthia Tinapple’s Craft Cast stone and sea glass classes. BTW…the garage studio is where my metal & etching work bench resides. Pros…great lighting (two huge corner windows surround the bench)…Cons…90 degree temps and 90%+ humidity environment. FYI…Kato clay preformed beautifully in that environment. The photo shows the strung clay/inclusion samples and some completed stones. The recipe for each stone is written on the sample disk. This technique is addictive and relaxing. Perfect ‘zen’ environment when your normally quiet home has been invaded a swirl of activity. 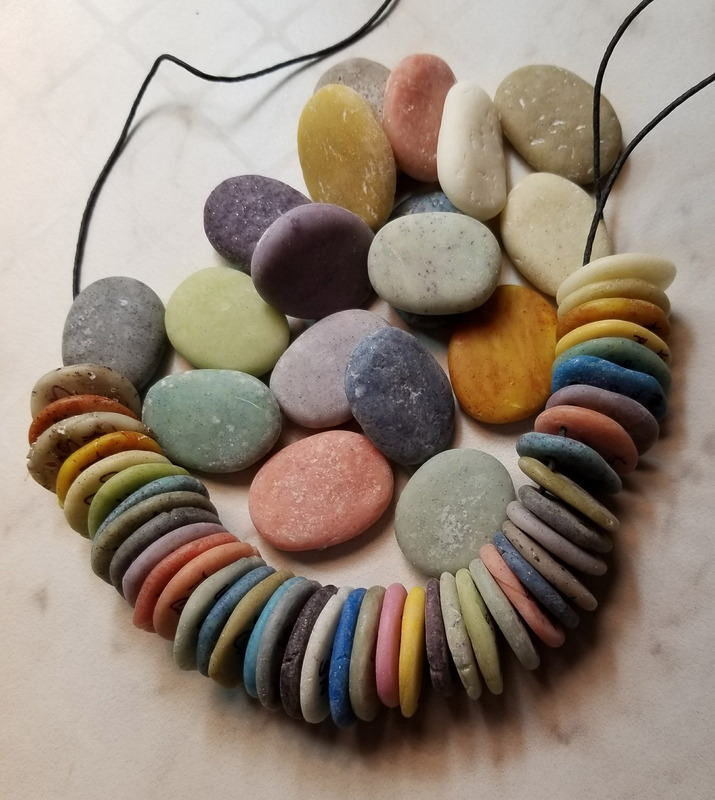 This entry was posted in mixed media, polymer, what if, work in process and tagged beach pebbles, cynthia tinapple, experiments, Kato clay, kiawah island, laurie prophater, mixed media, ornamental elements, polymer, sea glass, what are you working on this week. Bookmark the permalink.